As soon as the weekend rolls around we love giving you reasons to lock yourself away from friends/family/the outside world and get behind the kit. Well, we've gone and found another video that's sure to have you working on your chops right through to Monday morning. 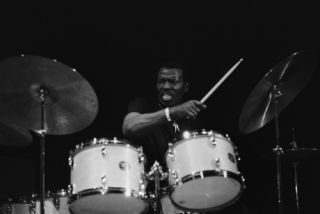 Take a look at the jazz masterclass from Elvin Jones below, it's pretty tasty stuff. For more inspirational drum clips and lessons, pick up the latest issue of Rhythm, which features playalong tracks from Gaslight Anthem, 30 Seconds To Mars and Vanessa Carlton, as well as play like Steve Gadd, Jose Pasillas and Peter Erskine lessons.